Thanksgiving was great and I had a wonderful day with my family. We filled ourselves to the brim with turkey and trimmings and later that evening, my husband and I went off to visit a good friend. The snow was flying and it really feels like Christmas is right around the corner. I didn't go out and do a lot of shopping on Black Friday, I really tried to avoid shopping that day at all costs. Most of my day was spent quietly with my gram while my husband had some things he had to do throughout the day but later that evening when he made it back home we went out and did some shopping of our own. I looked through all of the sale ads and was really sad to see yarn was not on sale at all, heartbreaking. I noticed Micheal's had a coupon available through their mobile application that would still be good later into the evening (it was almost 9pm when we got to the craft store) and it was for 40% off you purchase of regularly priced items. Micheal's has coupons all the time for 40% off one regularly priced item but this coupon for the entire purchase was something special. I ended up buying a good bit of yarn but you just can't beat that kind of price. I don't have any special yarn shops in my area and I am pretty much stuck with big box craft stores and the internet for my yarn but I am really happy with what I was able to pick up. 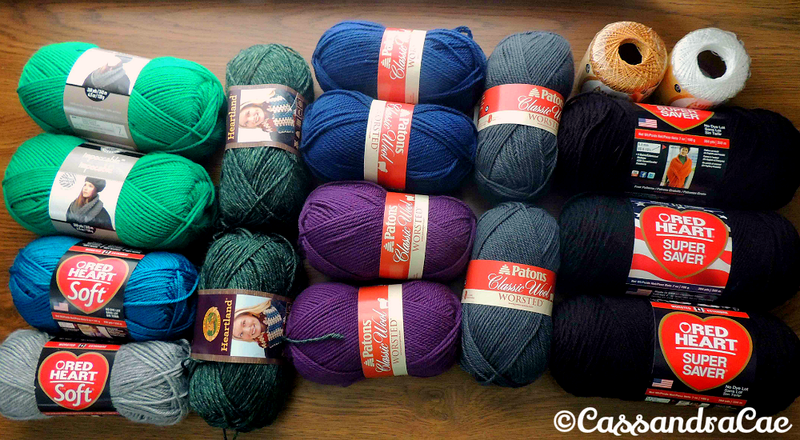 Here is what I got and how much it costs per skein normally and how much I paid for each with the sale. 6 Skeins of Patton's Classic Wool Worsted in the colors Mercury, Navy, and Royal Purple. These skein's typically cost $5.99 and I only paid $3.95 for each. 3 Skeins of Black Red Heart Super Saver. My Micheal's sells these normally at $3.19 a skein and I only paid $1.91. 2 Skeins of Lion Brand Heartland in the color Kings Canyon and I only paid $3.99 for each. They were already on sale so I didn't get anymore off on them. 2 Skeins of Red Heart Soft in the colors Light Grey and Teal. These retail typically for $5.49 but I got them with my 40% off coupon at $3.29. 2 Skeins of Loops and Threads Brand Impeccable in Kelly Green. With the sale I paid $2.09 a piece for these skeins while normally they sell for $3.49. Lastly I purchased 2 glitter Aunt Lydia's crochet thread balls. One in white with silver glitter and one in gold. Sadly they did not have any in metallic silver but I only had to pay $1.79 when normally they retail for $2.99. That was my black Friday haul, not to make a bunch of great stuff with all of this new yarn.